Key-Lore - A full service animal care facility. Providing Boarding, obedience training, burial services and pet cremation services 5 out of 5 based on 6 ratings. 6 user reviews. We love knowing Oliver is in very good hands! He gets to play and socialize while his Human Mommy recovers from surgery. Hopefully he isn't taking over like he's done at home. Thank you for taking such good care of our baby. We've been bringing our dogs here for years! We would drive an hour out of our way to bring our previous dogs here because Key-Lore is so great! I cannot say enough wonderful things about Key-Lore! Ryker had the best time and after only a week of training with Ms. Sharon Keillor he is a changed little man for the better. We will be back again, and again! Thank you Key-Lore! Love Keylore . Our bull terrier was buried here and we also had our newest family member (chapo) a angelican bulldog trained here. They work so well with animals. I can not thank you enough for the great care Cooper and Rufus received at Key-Lore. They came home happy and tired after spending 2 nights. Thank you again. They take excellent care of our two dogs. Fantastic operation! Malachi is a big baby...and was nervous the first time for Doggy Day Care. But he is loving it. Thank you for making me feel comfortable leaving my baby. Thank you so much for taking such good care of Larry last week, he seems to have had a wonderful time! The Happy Kamper Report is a great touch too! He will definitely be back for daycare, he keeps running to the door every time I put my shoes on...I think he misses his friends!! Ron and I lost our beloved Soda pup. Thank you so much for your compassion and for being there for us that week. We were allowed to come and see him during the week and have a private cremation on that Friday. We have his urn and the beautiful Rainbow Bridge with his paw print in our living room. We miss him every day. Thanks again for helping us through a most difficult time. Thanks for caring for my Girl (Zoe). You did a wonderful job. Key-Lore came to my rescue after my puppy broke her leg. When she was home alone, she kept chewing her cast off. This resulted in many trips to the vet, financial burden, and did not allow the leg to heal properly. Key-Lore welcomed her with open arms and closely monitored her each day. My puppy kept her cast on her leg and was able to heal. I am so thankful for them & would recommend them to anyone! Thank you so much for taking such great care of Sammie. You guys really came to my rescue when I had nowhere else to turn. She will miss coming here. We will keep you in mind for the future. Thank you so much for inviting us to join the fun at your Halloween Celebration. My students had a blast. I look forward to this event again next year! C.A.R.E. Would like to sincerely Thank You for supporting our Halloween Dog Costume Competition. Your participation was very much appreciated and a lot of fun. The event was a success. We made a net amount of about $800. We will purchase items for a K-9 care package. C.A.R.E. plans to make this an annual event. We will be inviting you back next year. Thank you for your amazing work you did with Tavin. It will make a much happier household for us. He is doing well as we continue to implement all that he has learned from you during his doggie boot camp! Thanks to your staff as well, for their time they spent with him over the last two weeks. Thank you so much for all you have done over the years for us. Winnie left us on April 18. She was 10 1/2 years old and a great dog. Part of the reason she was great was because of all of you. She loved coming there to Day Care. We appreciate everything you ever did for us. My wife and I have brought our dogs to Key-Lore for boarding and light grooming for nearly 20 years. We have always been extremely happy with the level of care and service provided by Sharon and her staff. Our "babies" have always been returned to us healthy and happy, complete with a "report card" about their stay! We have always believed the people at Key-Lore care about our pets and us in a personal way and we plan to continue using their services for as long as we have pets!! Thank you for your donation to our event for Mike Singleton help us build a House and thank you for staying to help. We raised over $4000, paid for food and T-shirts and still deposited $3380 for the house. They should be able to move in soon. Thank you, thank you, thank you so much for the wonderful job guys did with Tylers cremation you are all very wonderful and caring people. You guys have a very nice place over their and have a lot of wonderful things to offer people. Thank you again. We cannot thank you enough for the care and compassion you showed us at the time of Kasha and Kadie’s passing. “Our girls” were the farm mascots for 12 years and not a day goes by that their loss is not felt around the barn. They lived the perfect life for a pair of German Shepards and it showed in their overall health and longevity. It was so comforting to know that at our time of emotional sensitivity we didn’t have to even contemplate after care arrangement for “the girls.” Life continues at Genesis farm under a new generation of guardianship now. And, not a day goes by that we don’t somehow see the girls at work inside the minds and actions of “the boys” Barron and Wyatt. This gives us comfort that our girls are never truly gone. A special thanks to Lisa and Jake for everything you did for us with our dog Rigz, who we just lost. Thank you for all you do and your kindness. We would like to thank you for your services that you performed on Polo last week. This was very unexpected and quick. He was the love of our lives. So smart, loveable, and our best friend. He went everywhere with Bob. We would tease him and call him velcro. When Heritage acres called Saturday to say that they had Polo back was just a replay of last Saturday when we had to make that horrible decision. We are so glad that you were there for us.The certificate and the rainbow bridge poem is absolutely beautiful.Thank you for helping comfort us and all your services. Thank you so much from the bottom of my heart for taking care of my girl, “Addie”, after her passing.As a veterinarian, it seems as though I deal with death on nearly a daily basis but nothing compares to losing your own pet and true family member. Addie was my Christmas present when I was in the 7th grade and all my best (and worst!) memories were lived through with her at my side. She never complained when my veterinary -student-slave pager went off at 2am. I can’t count the number of trips she made between Lansing and Flushing through 7 years of college and dating! We still miss her dearly but the happy memories make us smile. We take comfort in knowing she was treated with so much dignity and respect. It’s very nice to meet you! I’m very excited that Lycos will have all that room to run around, and with other dogs, to boot! It gives me a peace of mind knowing that he will be in good hands. Thank you for letting me know about Cinder. I am anxious to get her back home with me.I want to thank you also for taking the time to go over how the Cremation is actually done and how you transported Cinder from Dr Taylors to your place. Thank you for your services at one of the saddest times of our lives. We know that our little Shadow (a.k.a. Stinky) was treated with the greatest respect and dignity while in your care. She is the third pet we have lost in the last three years – all of which you cremated for us. Having her back here with us has been comforting to me. Explaining how Stinky “turned into dust and got in the box” has been interesting to explain to our four year old – but she is glad that Shadow – although in different form – is back at home with us too. Thank you – and, no offense, but I hope we don’t have to use your services again for many years! Hi, we had our loving pet put to sleep at Caseville Animal Clinic over the weekend. My husband Eric, had set it up, for you to pick our Mallie up and hold her for us til the ground thawed. My daughters and I have sent some loving notes to place with her in her box. Thanks again for all your help during this difficult time for our family. I am so glad we found your services. We both would like to thank you and all of your staff for the terrific care that you have given Freck over the past 15 1/2 years while we were traveling. You have a great facility and we would certainly recommend it to anyone. Thank you again for all you have done for us. Thank you so much for the wonderful care Larry has received and continues to receive. Thanks for your patience and the time you spent training Larry. We all remember what the “Demon” he was at one time. You saved my “Best Friends” life (literally ) . Yes, you transformed him from the rotten “Demon” to the perfect “Angel” he is today. I can’t thank you enough for the transformation. Grandma and myself enjoy him so much and I honestly don’t think that would have been possible if it weren’t for your patience and wonderful care. Key-Lore is truly a dogs heaven.A special thank you to Dustin for the great care you give Larry. He loves you and his tail goes a mile a minute when he sees you coming. I would also like to thank Renae too. Larry loves you too. You are great!! You hire only the best, all your staff is fantastic.I highly recommend your services to anyone (even perfect strangers). Just wanted to say thank you for the compassionate care that you gave me when Carla, our beloved friend of 16 years, passed away a month ago. The exceptional care that you gave us from the 1st phone contact on Sunday when she passed, to allowing me extra time to say good bye, to picking up her ashes in the beautiful urn. Thank you to all of the staff for helping me through this difficult time. I have been meaning to send you a thank you since I got home… Cash is still doing great. I haven’t been able to walk him due to my surgery, but in every other way he is awesome. The kids have continued working with him when I could not. Thank you for all the time you spent with him, he is like a different dog. You are wonderful at what you do. Please tell everyone I said thanks and hopefully I’ll be able to bring him to play and for agility when we come down state. Thank you so much for assisting us with the purchase of the pewter urn. You went out of your way to make sure we got the right one. Toby can now be laid to rest along side his sister Niki.Pam & Steve ShawSharon,Thank you so much for helping us with Daymeon.God BlessDear Key-Lore friends,Thank you for hosting my first birthday party! I was one year old on June 1. My people thought the party hat with balloon pictures was cute! And we all loved the greeting card with the names of my doggie play pals. I admit that I liked that great big “doggie bone cookie” most of all!! Thank you so very much for encouraging Joe and I to unwrap Missy and say goodbye one last time.It helped so much for us to see that she was “OK” as we have felt so guilty keeping her for so long. 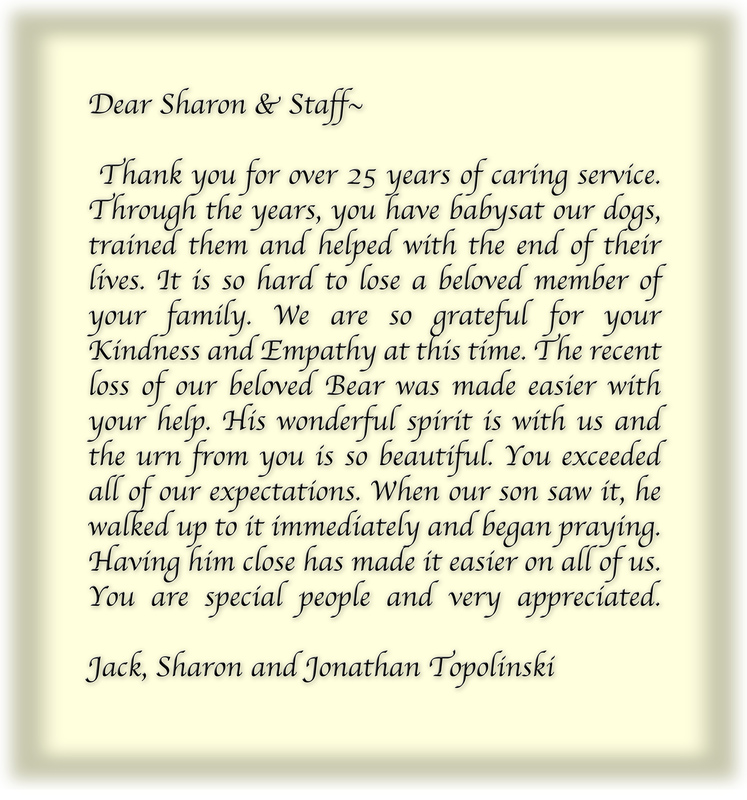 Sharon,Just wanted to thank you so much for your care and support with the loss of our beauty Lynne. We wanted to thank you for your true compassion for us and our wonderful beauty. She was with us a long time and a true part of the family. She will be really missed, but with your services that you provided, she will always be in our hearts.Words cannot express our gratitude for all you did for our family! Thank you for your kindness and gentle care. I don’t think I could have gotten through the day without your help. It is obvious that it is not just a business to you but that your really care about the loved pets and their people. Sharon,Thank you so much to talking with me the day Remedy died. Going home that night without her and being only with the dogs was very hard. I truly appreciate your thoughtfulness and compassion. I also appreciate that I was able to have Remedy ” back home” when my husband returned. Thanks again for everything. To the dear people at Pet Rest Gardens Cemetery,Thanks a lot for everything you do. Lisa,Thank you for all you have done for us. We appreciate your consul and advise. I just wanted to thank you so much for being so kind and caring. You do a wonderful job. I really appreciated you compassion for my beloved companion Lady Bug. Thank you so much for everything you did for us to make it easier to let Maxie go. Your care and concern for our family meant so much to us at such a difficult time. Thank you especially for the extra time you let me spend with her to say a final goodbye. Dear Sharon & Lisa,Thank you for taking such great care of our “Yorkie Family”. We especially want to tank you for your kindness and professional services you gave recently with our loss of Harley. We think its very important that you both know how much we appreciate you. Thank you for always taking such good care of Tillie & Dudley at Day Care. Thank you all at Pet Rest Gardens for taking such good care of my Bandit. Thank you so much for giving your time and services so freely. You have made this time a bit more bearable knowing that I could count on you to help.